World No.2 Rafael Nadal has withdrawn from Brisbane International. The 32-year-old Spaniard was limited to nine tournaments last year due to a string of ailments and had his Brisbane preparation disrupted November ankle surgery in November. The 17-time Grand Slam champion was due to play his opening Brisbane clash on Thursday – his first ATP tournament match since pulling out of the US Open semi-finals in September with an ongoing knee complaint. “I did an MRI and it shows a small staring on my left thigh,” Nadal said. “I tried to play, I wanted to play, but recommendations from the doctors (were otherwise). “It’s a small thing that can become a much bigger … when you compete the intensity on the muscle it can get worse. “I feel better than I did four days ago … It’s a risk to damage my body for one month if I play here. The Spaniard lost a three-set exhibition match against Kevin Anderson in Abu Dhabi last week before withdrawing from his scheduled second match. He practised at the Queensland Tennis Centre on Wednesday afternoon before making the announcement. Lucky loser Taro Daniel replaces Nadal in the draw and will face Jo-Wilfried Tsonga on Thursday. 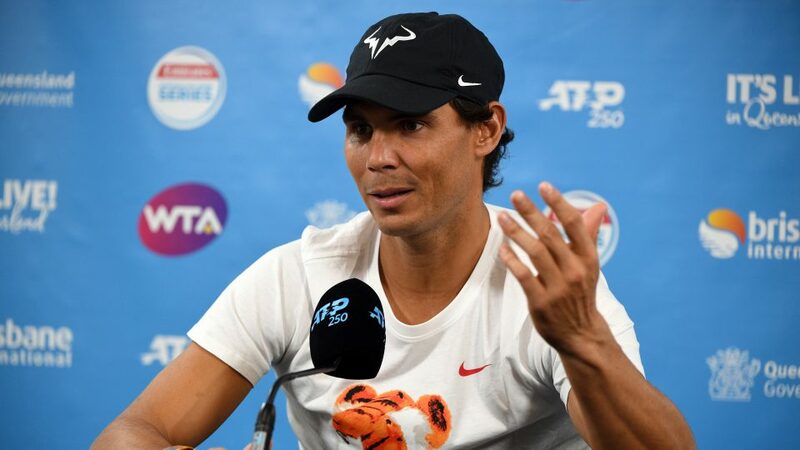 Brisbane International Tournament Director Cameron Pearson said: “We know how disappointed Rafael Nadal is that he has had to withdraw from the Brisbane International and is unable to play in front of the Brisbane fans this year.